This set is attuned to harmonise with the Seven Chakras of the human body, both acoustically and visually, producing seven different chakra-related notes and representing the colours of the seven chakras. There are main 4 categories of traditional singing bowls. Cast singing bowls are often painted with Tibetan designs on both sides. They are used by a wide range of professionals, including health professionals, school teachers, musicians and spiritual teachers. 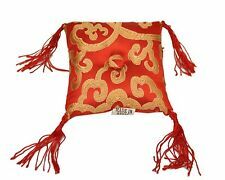 It is one of the ritual objects used by Tibetan. It has therapeutic value as well. They are made throughout Asia, especially Nepal, China and Japan. Singing Bowls have a double effect, with sound and vibration. Sings G notes. There are main 4 categories of traditional singing bowls. Cast singing bowls are often painted with Tibetan designs on both sides. They are used by a wide range of professionals, including health professionals, school teachers, musicians and spiritual teachers. This singing bowl is handmade and the mantras and other dieties are carved in it. Its a beautiful piece of art which can be decoarated also. Shining finesse, amazing sound. 1x 7" singing bowl. A chakra is thought to be an energy node in the human body. The word "Chakra" is Sanskrit for wheel or circle and also referring to the ‘wheel of life’, it signifies one of seven basic energy centers in the body. 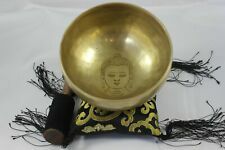 New Listing3rd Eye or Pineal Chakra A Note Hand Hammered Tibetan Meditation Singing Bowl 9"
This bowl is truly hand made in a traditional way at singing-bowl house. who are looking for real handmade bowl from Himalaya will not be disappointing by this bowl. The 3rd Eye, or Pineal chakra is located in the center of the forehead. This singing bowl is an antique and has been collected from Dolpa region of Nepal. 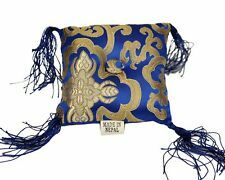 It is a collectible and was forged by the monks of the region. It has stunning acoustics and appearance. Looks rustic and smokey. I got this bowl in Nepal when i was there few weeks ago. This is a great singing bowl that generates nice sound. This singing bowl is handmade in Kathmandu Nepal. The script is the mantra of Avalokteshvara the Buddha of compassion. This is a set of seven gorgeous brown Chakra singing bowls. These bowls sing very easily and produce rich, harmonic and soothing sound that lasts for long duration. This singing bowls were hand-crafted in Nepal. Singing bowls (also known as Tibetan Singing Bowls, rin gongs, Himalayan bowls or suzu gongs) are a type of bell, specifically classified as a standing bell. Singing bowls sit with the bottom surface resting, and the rim vibrates to produce sound. When you played the singing bowls it reduced your stress and tensions. Its upgraded of your creativity and imagination. And also helped to harmonize body and soul. It is very well made. 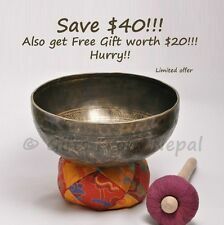 My friend in Nepal hand picked few really nice singing bowls and this is one of them. The amazing long lasting sound makes this bowl unique. Rather than hanging inverted or attached to a handle, standing bells sit with the bottom surface resting. Mantra etched, Hand carved,Hand made singing bowl set from Nepal. It has a beautiful sound. The pitch of the bowl when struck from the edge is usually the predominant sound, but when moving the mallet around the rim, the overtones and harmonics will begin to be heard and the range of these sounds is enormous. 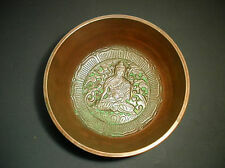 Tibetan Hand Hammered Singing Bowl 24cm W x 12cm H Handmade Nepal. This singing bowl is handmade and the mantras and other dieties are carved in it. Its a beautiful piece of art which can be decoarated also. Singing bells/bowls are unique hand crafted materials which has many uses and is popular for the music it produces. Note "C" Antique Tibetan Singing Hammered Bowl for Meditation from Nepal 10"
They are used by a wide range of professionals, including health professionals, school teachers, musicians and spiritual teachers. This singing bowl is handcrafted and made in Nepal. There are main 4 categories of traditional singing bowls. 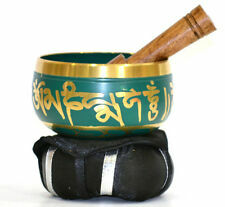 Tibetan Hand Beaten Singing Bowl Set - Chakra Healing Singing Bowl - Set of 5. There are main 4 categories of traditional singing bowls. Cast singing bowls are often painted with Tibetan designs on both sides. This 5 Set Singing Bowl is made in Nepal by hand in traditional Tibetan design. This 5 different size beaten Singing Bowls produces different beautiful sound. Helping to harmonize body, spirit and soul. This Relaxing Tibetan Buddhist singing bowl is crafted beautifully in Nepal. This bowl would be great for a gift or for your shrines. The bowlhas deep resonance, soothing and long lasting sound. 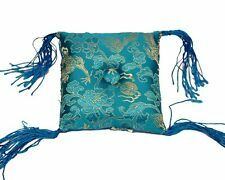 Set includes a bowl, a silk cushion, wooden mallet and instruction. 3rd Eye or Pineal Chakra A Note Hand Hammered Tibetan Meditation Singing Bowl 9"
Note "A" Antique Hammered Tibetan Singing Bowl for Meditation from Nepal 10.5"